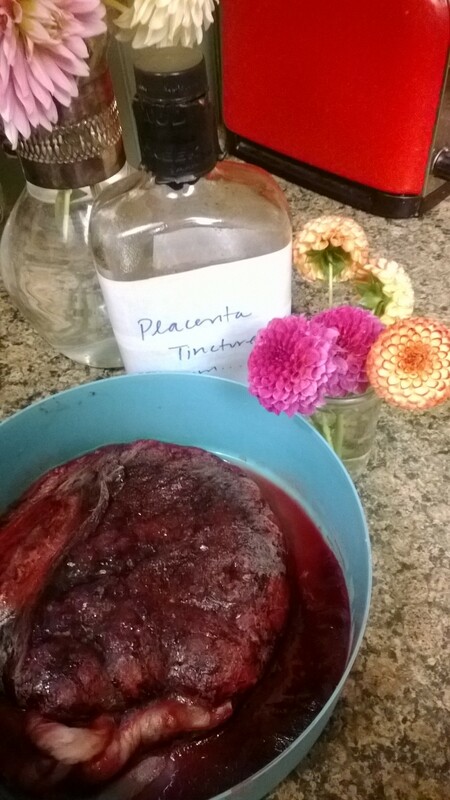 To make a placenta tincture, place an uncontaminated placenta into a glass container or jar. Uncontaminated means no antibiotics or medications such as pitocin or epidural were received during labor.You may choose to make a large amount of tincture from your entire placenta, or a small amount from a walnut sized piece of your placenta. The amount of tincture you want, will determine the size of jar you will use. The photo below shows two large jars for the entire placenta and a spoon to give perspective. 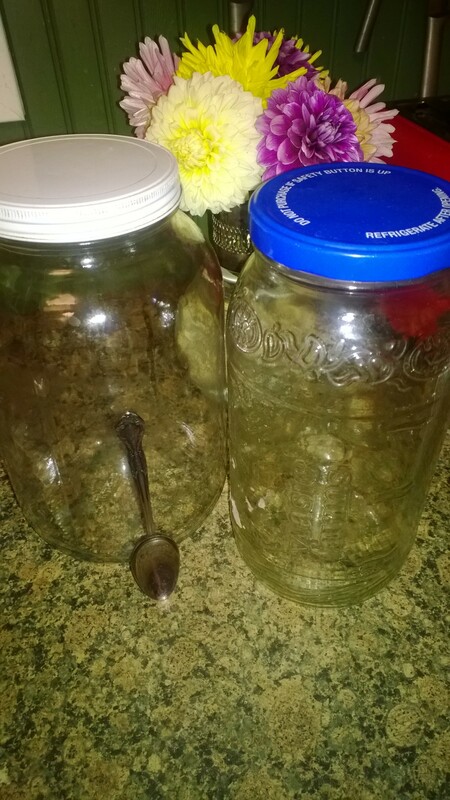 You can use something simple like the jar on the right, which is a sterilized pickle jar, or the jar on the left, a sterilized honey jar. Or, you can select something more elegant like this jar. Fill the jar, covering all of the placenta by at least an inch, with quality 80-proof vodka. You will need approximately 2- 750 ml bottles for an entire placenta or 2-4 oz if using just a small chunk. Tighten the lid to the jar and set in a cool, dark place for one to two months. Rock the jar every couple of days but be careful not to let the tincture or placenta touch the lid if if is metallic. Once the allotted time has passed, strain the fluid from the placenta using a stainless steel strainer and a cheesecloth. Pour the liquid, which is your tincture, into a smaller jar, preferably with dark glass. In the photo below, a sterilized whiskey bottled holds the bulk of the tincture while a smaller, brown glass bottle holds a smaller amount for day to day use. The bulk of your tincture can be stored in a cool dark place for several years and can even be used in menopause. You will want to keep your day to day tincture accessible for immediate postpartum use and throughout your first several years of parenthood. Adding just a few drops of tincture to a glass of water, juice, tea or just under your tongue each day will help your body’s system adjust to postpartum life, and not just yours but your family member’s lives as well. 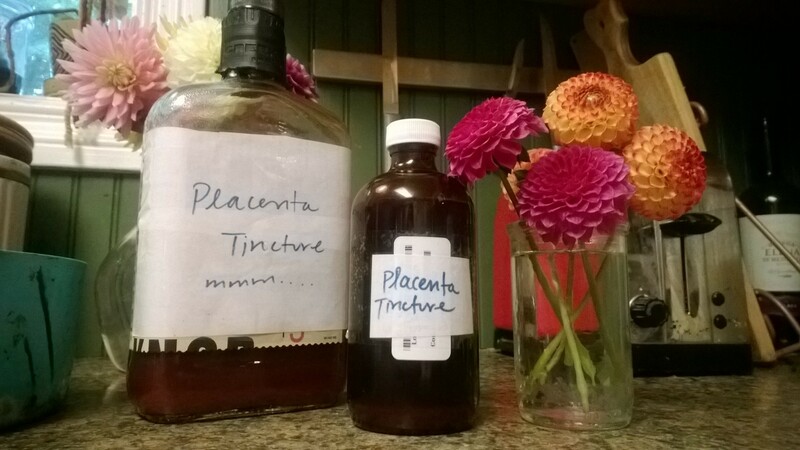 Share your placenta tincture with your partner and your children in times of transition and stress. This can include transition with the new baby, starting school, moving, getting sick; the list goes on and on and the benefits your tincture will too. Other suggestions on what to do with your placenta can be found here. Thanks for sharing this recipe! It’s been hard for me to find an actual post on HOW to make the tincture, so I truly appreciate your gift of sharing. I’m glad you found it! I wiish you a beautiful and strong birth experience!